Your guests would spend more of the time visiting you in the living room, but the bedroom is still very important. It is your home within the fortress that your house or apartment is. So it must make you feel right where you belong. It must speak to you in a special way, so to say. And so must the colors. The dark and stylish palette speaks of boldness and character. Those colors suit the queen-sized bed well. 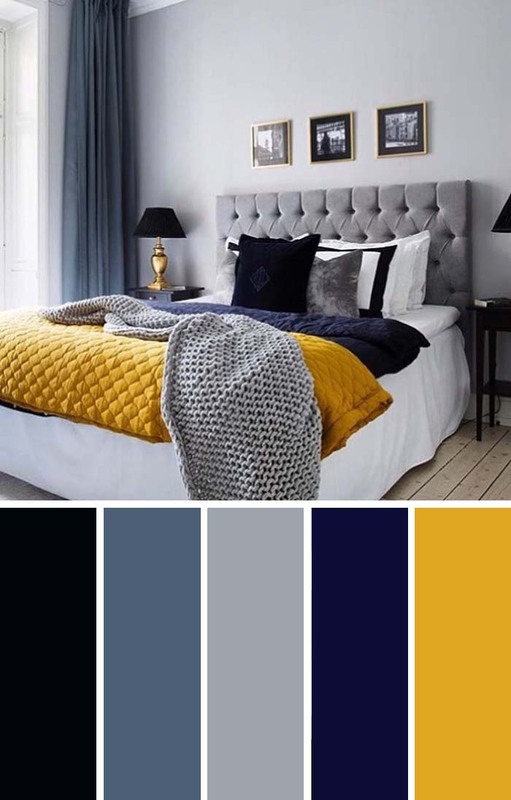 The golden-yellow blanket makes all the difference between conservative style and splendor, turning the almost monochrome bedroom into a vivid statement of class. Bedrooms are not usually the place where you bring guests, so it is in a way the most personal spot in your home. That also makes it the one you should design with just one thing in life, and that is what makes you feel good. If you want a quiet and calm place for relaxation, then those pastel tones will really ease your eyes and make you happy and comfortable. This bedroom is all about calming paint colors. You already know black is one of the best solutions for a slick furniture set. What some people overlook, though, is the fact that beige is one of the best colors: it matches well with so many other colors, fits well to grayscale without ruining the impression, and brings in warmth. Purple is a bold and demanding color. But in its many shades, it is also one of the colors of life, spring and nature. So, it is well-worth it to try it out. In this room the lavender is understated, but there are hints of purple in almost any part of the interior. 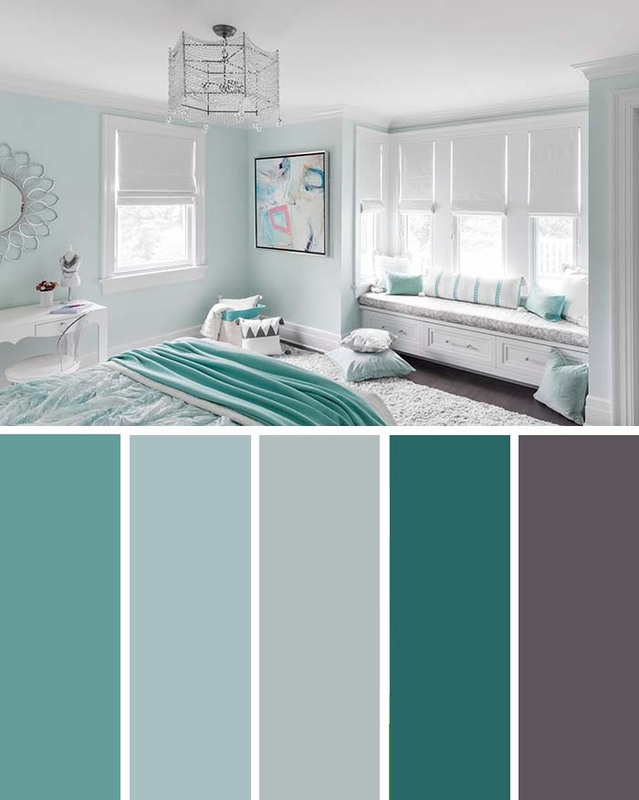 The turquoise palette in this room makes it at the same time seem clinically clean, and have its own unique style. The color goes all the way from the bed sheets and freely scattered pillows, to the walls and the painting. There are a few different shades, but the richest nuance serves as an accent color. Yellow and navy blue go well together, and black is rarely out of place. This room utilizes rich saturated colors, such as the navy in the walls, and adds splashes of white and gold for a welcoming contrast. 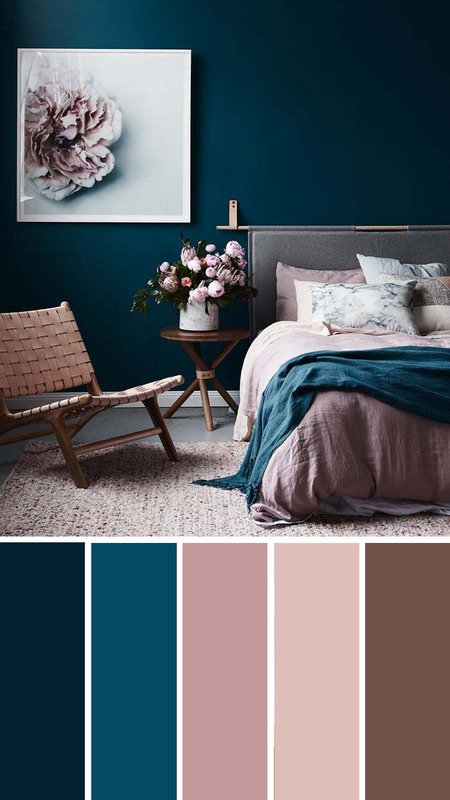 Even though navy blue is a great background color, that is not its sole use in beautiful modern bedrooms. For those who prefer brighter and better-lit rooms, which reflect and don’t soak up sunshine, there is still a great way to include navy blue. The way it contrasts to the soft blue walls makes it stand out as an accent. You don’t need much color to have a nice atmosphere indoors and this bedroom proves it. Grayscale can really suffice as long as your designer has proper understanding of how different levels of saturation make you feel. This huge king’s bed is surrounded by rich grays and cream, which create neutral, but atmospheric surroundings. 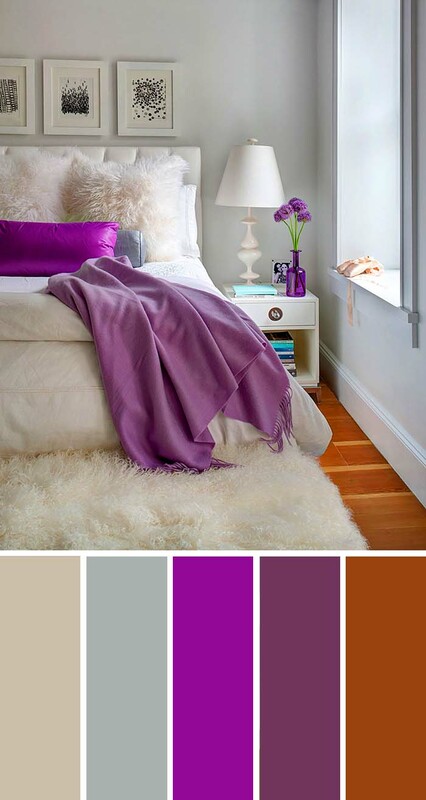 As we said earlier, nuances of purple are great accent colors. The bed cover and pillow in purple and lilac add life to this room, which is otherwise comfortingly, but boringly plain white. Additional nice splashes of color are the beautiful floor and the subtle walls. 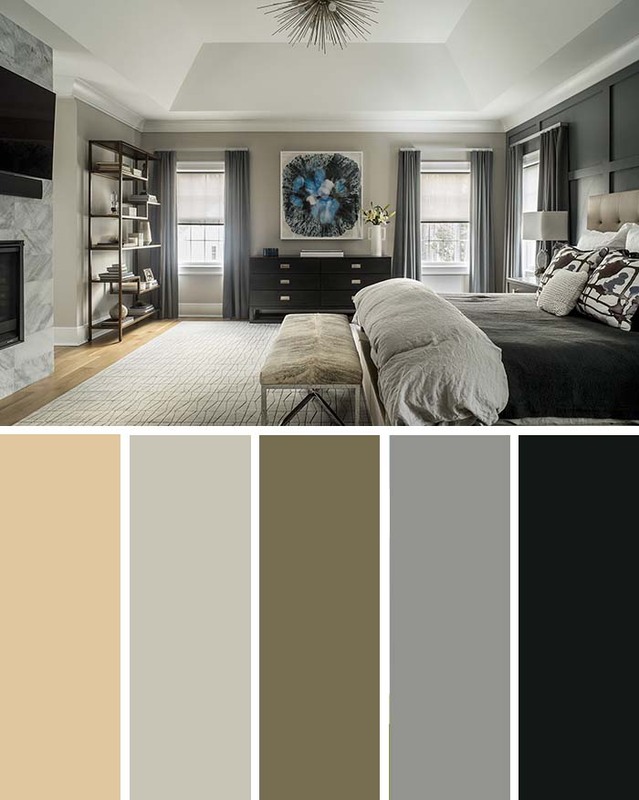 Another way to complement an understated color scheme is to rely on earthly tones, such as brown, soft orange and beige. This is just what they did here, if only to subtly energize the white and grays we see in the headboard and floor. 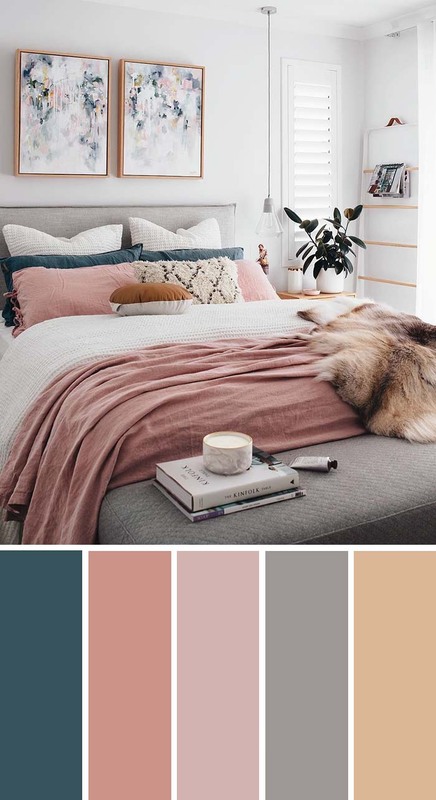 the beautifully rich wall goes well hand-in-hand with the dusty rose of the chair, rug and bed, because it is a softer shade and gives a relaxation counterpoint to the intensity of the teal. 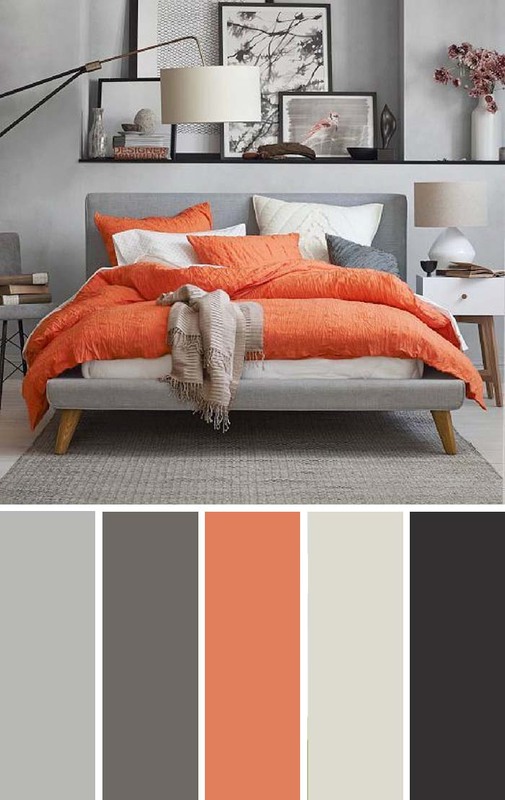 Any combination of neutral gray and bright colors is bound to grab attention and so does this bed. A clear center point of the room, it instantly makes the feel of this bedroom dynamic. All the additional color around comes in small splashes just to make sure the bed doesn’t look completely out of context. The feel of sunshine and seashore relaxation is not easy to bring inside closed doors. Some shades of blue and yellow certainly help, such as this beautiful blue color, but they also need to be helped by some huge windows to let in light, and much space to allow owners to feel unrestricted. Pink is a very girly color, but for a more mature feminine look, something more is needed. Gray to add structure, white to help emphasize the rest of the colors, and why not some blue as an accent. Now this room is a true classy feminine retreat to proudly live in. 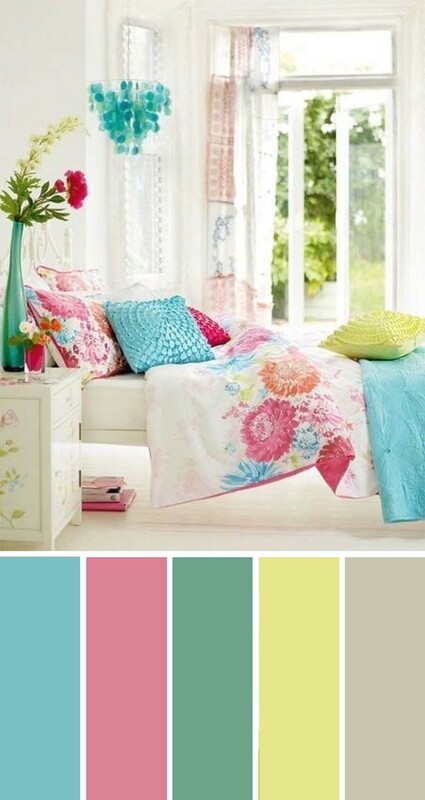 Some people need more than relaxation in their bedroom – just plain fun and great mood come in bright colors. A rainbow of colors mix in this room to create a positive vibe and to ensure the room reflects its owner’s creative spark. Forget white and black, this is too pretentious for a bedroom. You will need some color to feel well. And, even though many colors claim to be ‘the new black’, here is our piece of mind: navy blue always was its natural successor. 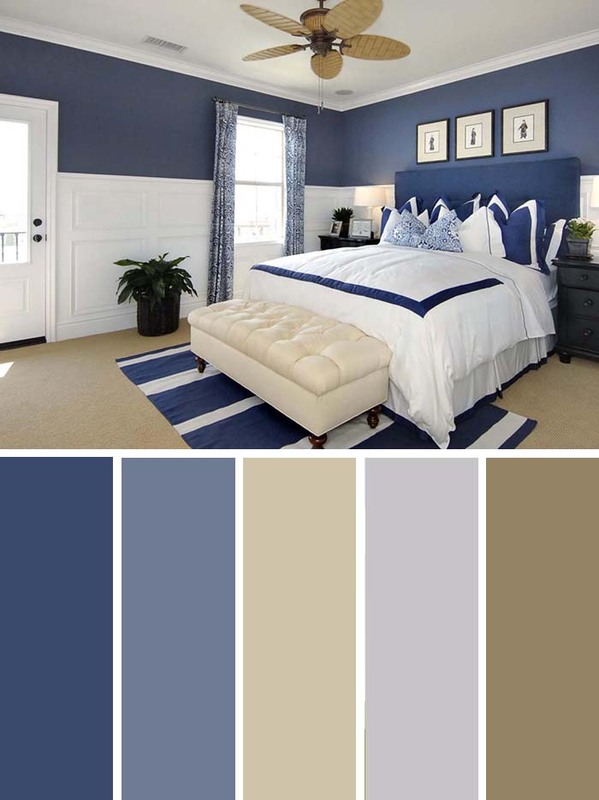 The beige floor and the white wainscoting, bed cover and ceiling help the blue stand out and it does so greatly. You like earthly tones but are afraid they can be too bland. You need that special splash of color. Here is a solution for you and it comes straight out of the sea: this coral painted room feels like a living organism, because it is just so lovely. But the soft subtleness of the pink also makes it great for relaxation. Green is a color of nature, life and vitality. Many people feel extremely relaxed outdoors, surrounded by plant life. And so will you in this beautiful bedroom, the interiors of which made us fall in love with this made us plan a trip to the woods. This classic combination would feel just a bit too dark if not for the bright accent yellow. Now it looks classy and elegant, partly because the yellow is a brave choice, which demonstrates confidence. At the same time, it is refreshing and exciting. Taupe is a shade of gray, which contains just a tiny hint of brown for some extra sophistication. Pale pink is a subtle version of pink, which looks stunning, without being overwhelming. The two combine in this classy and gorgeous palette. Choosing the right colors for your bedroom always sounds like a risk. But once you get inspired by these beautiful combinations it sounds more like a playground for your fantasy, as there are so many variations you can try and there is no limit to imagination.